Is a Woman Ever Really Sorry? 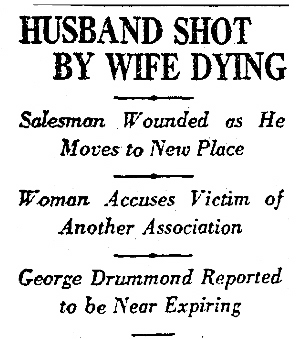 George and Mabel Drummond had nothing if not a tempestuous wedded life. Married ten years, hitched when George was fifteen and Mabel twenty-one, their stormy union included many a sterling instance, including the time a jealous Mabel held George in a chair at gunpoint for three hours while she threatened to shoot him with every passing moment. Today, after the usual morning argument in their Alhambra home, George announced he’d had his fill, and moved his stuff out to go shack up with…a widow. Tonight Mabel followed George to 335+1/2 West 42nd Street, where George was involved with one Mrs. Helen Salyer. Along for the ride Mabel had taken her old friend the pistol. In fairness, Mabel did, on the sidewalk in front of Helen Salyer’s house, give George one last chance, asking him to come back to her. George approached and said, firmly, no. With that, Mabel shot him in the stomach; the force of the blast turned him around and Mabel shot him again in the back. Mabel walked back to her car, got in, and sat calmly there until authorities arrived.